We had a wonderful weekend visiting with our families in Dekalb. Pippi and I even had time to stop by and see the darling little Scottie named Jazzi. This is our second visit with her and she just gets more adorable. I’m convinced they are sisters, even though they are from different breeders and don’t have the same birthday. We had a wonderful visit and I got to meet the newest addition to the family, Addy. Pippi was not the best house-guest, she snatched a bone right from Addy’s chompers! I think that Jazzi is just adorable and could kiss the fur right off her little head. While her mom, Diana, and I were chatting the two Scotties where switching places; figuring out who’s lap they liked better. 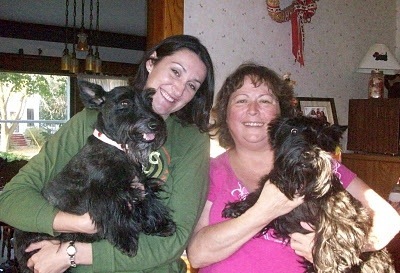 This entry was posted in dogs, Pippi, Scottie Stuff and tagged Jazzi's World, Scottie dogs, Scottish terrier. Bookmark the permalink. Thats right, and we had fun switching around. I was so glad that you came over and anytime you are in the area come on over!! Love you lil sis!! When are you coming to UT? Jake and Albert really want to meet Miss Pips! They said they’d be on their best behavior and show her a really good time. I hope very soon!!!! Josh and I rarely get West Coast tours. I’m not a driver so we have to stay on the East Coast. Sounds like a great visit. Both dogs look beautiful…..and why not, they’re scotties.